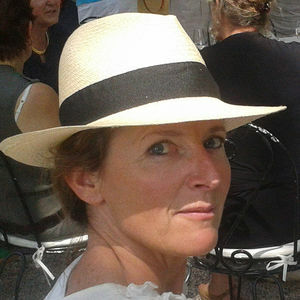 Former student of the Ecole Supérieure d'Arts Appliqués Duperré (Paris), textile designer, Helene Lamoureux has been painting for over 25 years, under her artist name RIME. It is said that the figurative represents certains realities and abstracts of intentions. Enthralled by the colorful tints of the artist ROTHKO, my approach to painting is to define my statements with colors, applied with large brush strokes and to search for new materials. I use acrylic like oil, applied generously, constantly looking for new chromatic effects. To this base, I add various materials, like oil pastels, chalks, inks, pigments, smoothed Chinese rice paper, gold leaf, as well as natural elements like grass, sand, and gypsum... I stretch my own canvas, sometimes with linseed oil revealing the thread bare on frames with atypical shapes for original compositions, in diptych, or even triptych format. At first glance, one would qualify my paintings as figurative, its true, but when they represent a Medina, a Buddha, or the St. Victoire mountain, with highly stylized forms, I bring my own print and perception of a world or a culture , that at first isn't very familiar and that I try to tame with the tip of my brush. I found this reality during my 10 years abroad, in Malaysia, Morocco and Italy and now in my adopted region of Provence, France. I immerse myself in a new environment, new landscapes, and assimilate a new vocabulary of shapes, colors, smells, different atmospheres and distant horizons to recreate "my world," a harmonious world, full of spirituality and peace in which the viewer is invited to return gradually to receive with his own sensibility, his own felt. HANDS : 2015 is a new theme that differs completely from my landscapes subjects, as much as the medium, as the colors and the subject. Here there are no effect other than the acrylic applied generously with a large brush to a base of walnut stain, a partiality for grays created with only primary colors and white and of course, the hands, of which I tried to translate the expression. LANDSCAPES HERE AND ELSEWHERE: from 21012. Very stripped down, close to abstraction in very muted tones with walnut stain used by cabinetmakers. As my research progressed, I discovered how walnut stain is rich in chromatic effects, a lucky happenstance of which I took advantage. The walnut product when worked with acrylic allows me to obtain muted and deep tones. These landscapes are from my imagination but are strongly inspired by my adopted region of Provence. They include themes dear to Cézanne, the Mont Sainte Victoire, the pines trees, the sea ... DRAWINGS OF NUDES : From 2006 to present. Sketches of living models, men and women, creatad in the workshop and reworked on canvas by creating a special atmosphere for every pose. The female model have often inspired angel silhouettes. Acrylic, ink, crayon and very few colors to spotlight the drawings. FROM ASIA TO AFRICA. 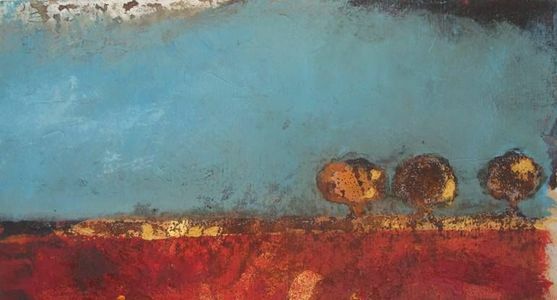 The paintings from the period abroad between 1998 and 2006 are often religious themes (Buddhas, monks, mosques, veiled women, people in prayer) as religion is omnipresent in both Asia and Morocco. Acrylic and mixed media on sik paper pasted on canvas (ink, aquarelle, oil pastel) ALL MY PAINTINGS have a matte finish. I use very good acrylic paints and I finish the details very carefully. In the 25 years I have painted, I have never had any problems with premature aging or weathered paints.